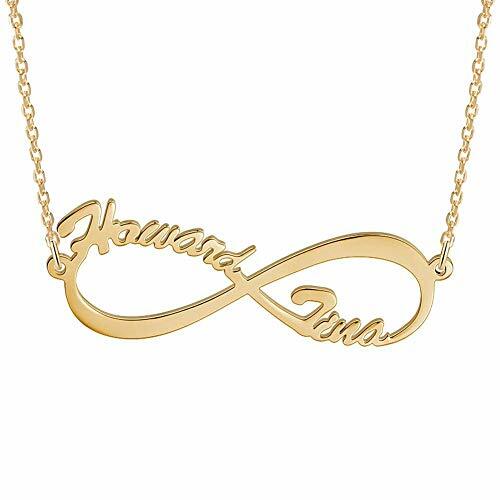 Given its powerful meaning, the infinity name necklace jewelry makes not only the perfect gift but also the perfect addition to your collection. Combine it with your own unique personalization and you have a piece that is not only stylish or timeless but can also be entrusted with acting as an eternal keepsake and memento of your love and relationships. The most popular immortalization of the infinity symbol can be seen in the classic Infinity Name Necklace, the evolution of which has seen it further developed into double infinity and vertical infinity an even heart infinity necklace designs. 1. Click on "Customize Now" for personalization. 2. Type in your name to preview. 3. Add to cart and check out. 1.Avoid wear and sudden blow. 2.Put it in a soft cloth or a box when you are not wearing it. 3.Keep it dry. Don't wear it when swimming or taking a shower. 4.Wipe the necklace surface often with cleaning cloth to keep the luster. Infinity in Fashion: The meaning behind an infinity name necklace is beautiful, it symbolizes eternity, empowerment and everlasting love. Gift-giving Ideas: A lovely jewelry gift for anniversary, engagement, birthday, wedding, friends, Christmas, mother's day, valentine's day and more. Unique Design: There is nothing better to express your love than cutting two people's name on the same unique necklace. Personalized Details: Up to 8 letters per name or word, one capital letter per name or word. No punctuation and symbols. Measurements: The length of the adjustable necklace chain varies from 16 to 18 inch. Pendant Length: 44mm, thickness: 1.2mm, height: 14.5mm. If you have any questions about this product by Hybedora, contact us by completing and submitting the form below. If you are looking for a specif part number, please include it with your message.